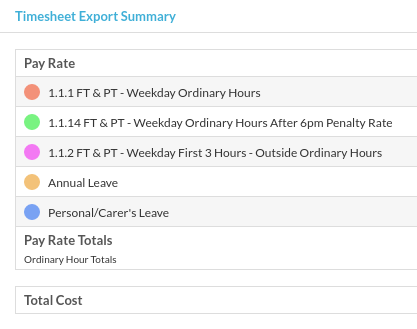 The Timesheet Export Summary in Tanda is your final step before you export your Timesheets to Payroll, to ensure that you are happy with how the Award or Pay Rules in your account are being interpreted and what staff are going to be paid for the pay period. Scroll to the bottom of the timesheet, until you see the heading Timesheet Export Summary. Finally, the last column is the Cost which totals down to the Total Cost for the timesheet. This displays the information in the Timesheet Export Summary in a graph format which can be useful for seeing the span of the rules applying. If you find that you don’t agree with the Timesheet Export Summary, first check on the employee’s profile that they are setup correctly. Or by going to Workforce > Staff > clicking on the employee's name > Payroll tab.